In the wintertime, humidity levels plummet as temperatures drop and forced air heating systems dry the air out even more. During these months we are extra conscious of electrostatic discharge. Many will make a habit of grounding themselves to a doorknob or rack case before touching any controls in the studio, so as to avoid zapping the electronics with static electricity. When winter gives way to warmer weather, thunderstorms and line surges present a new threat to our precious technology. Broadcast engineers take steps to protect their mains power inputs with spike suppressors and surge protectors. These devices can help, but can only do so much with the extremely fast transient swings in voltage that are observed during these events. There are also threats that are not so obvious. In keeping with a company tradition of technology and innovation, the Telos Alliance was recently named a Cleveland Technology Awards Honoree in the Established Tech Firm category. Presented by Smart Business Magazine, the Cleveland Technology Awards recognize Northeast Ohio organizations that develop and implement impactful technology. CEO Frank Foti accepted the honor at a luncheon on March 23. Digital signage technology is showing up everywhere - from swanky elevators to shopping malls to restaurants. Now, some radio stations are using this tech to inform station visitors, on-air talent, and station staff. As engineers we’ll be called upon to implement such systems. 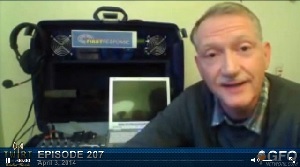 Jeff Schick joins Chris Tobin and me to explain what to look for in digital signage. New ways to talk with listeners - and share their video calls; IP-audio codecs keep getting smaller and better; same goes for FM transmitters with a new rack-mount 10 kilowatt model; the FCC proposes office closings for a modest savings, but will they be at NAB? Drones are hot for broadcasters and the FAA. Plus we look at who’s getting some big honors in Las Vegas next month. Chris Tobin and Kirk Harnack look forward to NAB in a couple weeks. 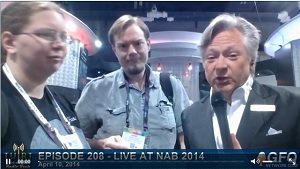 Chris Tobin and Kirk Harnack bring some of the best of NAB 2014 live from the NAB Central Exhibit Hall. One after another, engineers and company execs answer questions and share with us what’s hot at this year’s NAB. First Response Radio - on site within 72 hours of a natural disaster where other mass communications are crippled - provides needed humanitarian information at the right time. Mike Adams, an accomplished broadcast engineer, leads the mission to design and deploy suitcase-sized broadcast studios and radio transmitters. We’re talking with Mike and learning about First Response Radio’s mission, operations, and logistics. This is radio broadcasting at the most local level - and designed to help people when and where they need help and information the most. If you’re like any engineer we know, you’ve likely got a smartphone or a tablet. And you probably know that there are apps out there – hundreds of them – designed specifically for use by you. Finding them… well, that’s another story. One of the most common things that we hear today is how busy people are. Engineers have several stations to try to manage, programmers have multiple formats to try to coordinate, and General Managers have to set aside time to listen to engineers and programmers complain about how busy they are.